If your pet has runny eyes, you’re not alone. This is a fairly common problem among dogs and cats. Proper treatment of your pet’s eye problem will depend on the cause. If your pet has excessive tearing, or epiphora, the constant watery discharge can irritate the skin around the eyes, create an unpleasant odor, and even cause an infection. This discharge also contains pigments that can stain your pet's fur a reddish brown color. Epiphora is a common problem for pet owners. Unfortunately, it can be a very difficult problem to solve. If your pet's eyes suddenly start tearing excessively and you notice other signs of irritation like a partially closed eye, squinting or pawing at the eyes, this is an acute situation requiring quick action. There could be a foreign object lodged in your pet's eye, or a tear or other damage to the eye itself. It's likely your dog or cat is in some pain from the eye irritation. You should call your veterinarian for an immediate appointment. This is especially true if it seems your pet is having trouble seeing. Some breeds of dogs naturally have hair in their eyes which occasionally causes irritation. Hairs from the face can angle into the eye. Eyelashes can grow in odd places like the corner of the eye or under the eyelid, or they can curve into the eye rather than away from it. If your pet is experiencing an allergic reaction to household cleaning products or air pollutants like cigarette smoke, dust or smog, his eyes may tear. Your dog or cat can also develop sensitivity to typical human allergic triggers like certain fabrics, dander, and pollens from grasses and trees. If your pet isn't eating a balanced, species-appropriate diet -- for example, if the food you feed contains grain or the same protein source day in and day out, his system may be trying to get rid of the elements in his diet his body can't properly assimilate. Animals detox through not only their bowels, but also their eyes and ears. Dry eye (keratoconjunctivitis sicca or KCS). Normal tear production provides a number of benefits to the eye including lubrication, anti-bacterial agents, and the flushing away of irritants and infectious agents. Your pet's tears come from two lacrimal glands – one is located just above the eye and the other is in the third eyelid. Dry eye is a condition in which the tear mixture, which consists of oil, mucus and mostly water, is absent the water. Only oil and mucus are being secreted, which is why pets with KCS have thick, yellow discharge from their eyes. The eyes get red and the cornea in time turns brown. If the condition isn't treated, blindness can result. There are a number of causes of dry eye. The most common is immune mediated destruction of tissue in tear-producing glands, a situation which is often seen in Cocker Spaniels, Miniature Schnauzers, and West Highland White Terriers. Other causes include: canine distemper, herpes-related feline upper respiratory infection, trauma to the head, exposure to certain antibiotics and anesthesia, and removal of the third eyelid lacrimal gland which sometimes occurs during surgery for cherry eye. Corneal injury. If your pet has a corneal ulcer, the conjunctiva of her eye – the pink tissue which lines the undersides of the eyelids – will turn an angry red color and there may also be some swelling. If the condition is painful, your dog or cat will show signs of discomfort like squinting or pawing at her face. Your pet might also have a scratch or other wound on the surface of her eye caused from contact with a plant or bush, a scratch from another animal, chemical irritation (from shampoo, for example), or a foreign body that gets caught under an eyelid and rubs abrasively against the eye. Your dog or cat can also self-injure by rubbing or scratching her head or ears. Feline upper respiratory infection. Feline URI is typically caused by either the herpes virus or calicivirus. If your kitty has an upper respiratory infection, you'll see other signs like sneezing, coughing and a runny nose. Brachycephalic breeds. These are animals with ‘pushed in' faces, for example, Boston Terriers, Boxers, Bulldogs, the Pekingese, Pugs and the Shih Tzu. There are also a few brachycephalic cat breeds, Himalayan and Persian, to name two. Brachycephalic dogs, in particular, have eyes that don't always seat well in their heads. The eyes of some of these dogs are so prominent the lids can't close all the way. This situation will invariably lead to drying and irritation of the eye unless there is surgical correction. Eyelid problems in general are common with brachycephalic breeds. Often, normal tear drainage is impossible, which results in runny eyes. Another more serious situation is when the eyelids roll inward, causing the lashes to rub against the surface of the eye. As you can see, there are a number of reasons why your dog's or cat's eyes might tear excessively. It's extremely important to find the underlying cause in order to effectively treat or manage the situation. Some reasons for runny eyes, like an allergic reaction, are easier and less costly to remedy than others. But excessive tearing due to eye irritation isn't something your precious dog or cat should have to live with indefinitely. I encourage you to make an appointment with your integrative or holistic vet to determine the root cause of the problem and discuss what treatment options are available to insure the comfort and health of your pet. If your vet determines your pet's excessive tearing isn't the result of irritation, an injury or an eye infection, the next step is to consider whether the tears produced are draining as they should. Fortunately, a simple non-invasive test can be performed to see if your dog's or cat's eyes are draining normally. A special stain, fluorescein, is applied to the surface of the eye. If drainage is normal, there will be evidence of the stain solution at the nostrils within a few minutes. A healthy eye is very efficient at managing the flow of tears. 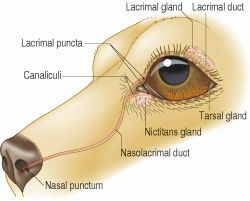 The eyelids contain drainage holes -- the caruncle and the nasolacrimal puncta. In addition, the nasolacrimal duct allows the flow of tears into the nasal passages and throat. In animals with shallow eye sockets, including brachycephalic breeds, the eyelid space is frequently not deep enough to manage the quantity of tears produced. The overflow never makes it to the eyelid drainage holes or puncta, but instead spills over at the corners of the eyes and runs down the sides of the nose. This isn't a situation that can be repaired – it is a result of the construction of your pet's face. Entropion. This is a condition in which your pet's eyelids are turned inward, blocking off the puncta. In long-haired breeds, the fur can actually ‘wick' or pull tears away from the eyes to the skin. This is especially prevalent in breeds that grow hair on the caruncle of the eye – the moist, pink area easily seen in the inner corner of the eyelid (yours or your pet's) closest to the nose. Your pet might have had an infection or injury that caused scarring to drainage areas of the eye. This can sometimes be remedied by putting the animal under general anesthesia and flushing the ducts with saline to re-open them. If you have a Cocker Spaniel, a Poodle or another breed in which the puncta are sometimes congenitally closed, surgery can correct the situation. Unfortunately, many breeds prone to eyelid and eyelash problems are also prone to conditions of abnormal tear drainage. That's why it can be so challenging for your veterinarian to determine which of several potential underlying causes is producing your pet's runny eyes. If your pet has a tear drainage problem that can be resolved with surgery, I recommend you consult with a veterinary ophthalmologist. These vet specialists will have the training, experience and specialized equipment necessary to perform delicate eye surgery.